Finnish Folk Fiddling Legends Tour USA. BRING THE KIDS TO ARTO & ANTTI -- for this show we are admitting ages 16 and under for free when accompanied by parent or adult guardian. On Wednesday, December 10, the Community Center for the Performing Arts and KRVM proudly welcome Finnish Folk Fiddling Legends Arto and Antti to the WOW Hall. 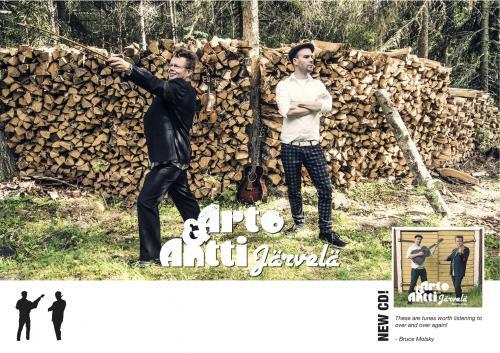 Cousins Arto and Antti Järvelä are members of the famous Järvelä music family of Kaustinen, Finland. With centuries of family tradition behind them, they are touring the US playing music from their first album together, Os fera liluli. Järvelä fiddlers have been fiddling in the front line of weddings in Ostrobothnia (on the eastern shore of the Gulf of Bothnia, the northernmost arm of the Baltic Sea) for generations, as far back as Juho Järvelä (1794-1837). A long heritage also comes from grandma Martta's (born Kentala) side. The first non-Järvelä fiddler known of was Juho Wirkkala, who had to pay a fine of five Finnish marks for the crime of playing fiddle in a dance one Sunday evening in 1726. Growing up in a musical family means growing up with a respect for traditions and history. Arto's and Antti's roots are naturally in Ostrobothnian dance music and ceremonial tunes. With the influence of international traveling and late-night music sessions, both cousins are composers of original music, continuing and expanding the tradition while staying firmly rooted in it. For many years, Arto and Antti have been making music together and separately with different groups, most notably JPP and Frigg. The duo has toured in Canada, Denmark, Norway and United States. Arto plays with JPP, Nordik Tree, Kaivama, Maria Kalaniemi, Erik Hokkanen & Lumisudet, and also performs solo. Antti is known for his work with Frigg, JPP, Baltic Crossing, Troka and Kings of Polka. "Thanks to Arto and Antti for allowing us a peek into this sweet musical family affair. Although grounded in the music with which they grew up, you can see here how they've each grown to embrace and embellish on everything musical around them. Schottische. Waltz. Polska. The result is far-reaching, soulful and intimate. Each piece is bright and visual, a mini-journey to some interesting and far-away place. These are tunes worth listening to over and over again!" Together, Arto and Antti balance the authentic down-home Kaustinen style with contemporary flavors, character, charm and flair. This month, Arto and Antti bring us a spirit-stirring, heady breath of crisp Finnish air! Tickets are $15 in advance, $18 at the door and $20 for reserved seating. Doors open at 7:30 pm and showtime is 8:00.